No logs => No support. If you can not find the time to provide the info I need to diagnose your problem do not expect I will find the time to reply to your post. I would like to thank CardBoardBoxProcessor and Keptin for their amazing MechJeb models. 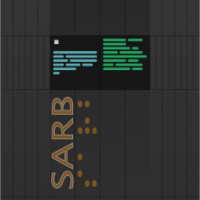 Sarbian is the current maintainer. Add ‘At the highest AN/DN’ and ‘At the nearest AN/DN’ time selectors for inclination and plane maneuvers. You can also get the latest dev builds here. Use the button on the right side of the screen to access MechJeb window selection interface, and click on the buttons to activate the windows. The windows can be dragged anywhere on screen, and their position is saved and reused among all rockets. Adding "eduMode = true" to the module will rename the SmartASS to SmartACS. You can use this Module Manager patch to do it. CKAN has all the release of MechJeb. select the MechJeb-dev line, click OK and exit the options. The MechJeb menu is not showing. First make sure you have the part on your ship (AR202 case in the Control section). 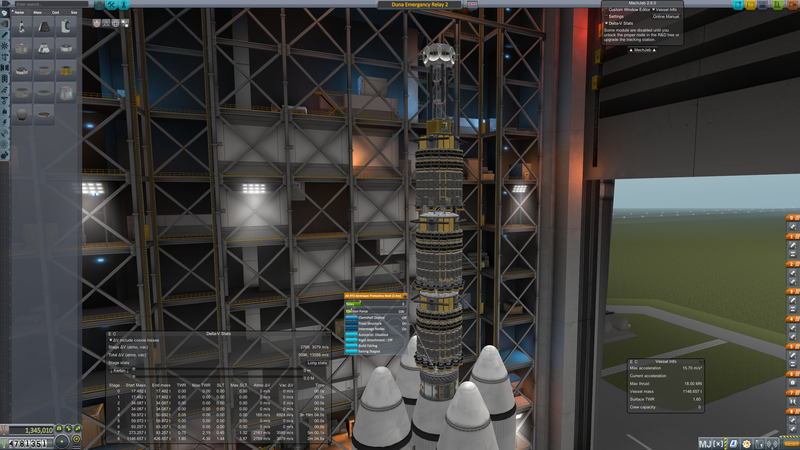 Some windows protection and anti-virus can sometimes block KSP from loading MechJeb. You should install KSP outside the C:\Program Files (x86) directory. Steam has an option to change the install directory of a game or you can just copy the directory somewhere else. The dev release gets all the new features and bugs fix and the main version gets them when a new KSP version is released (or major bugs requires it). If you experience a bug the first thing I advise is to try the dev release. You can read the change log of the dev release here. If your bugs don't seems to be fixed then please open a new ticket on the project tracker. Don't forget to include a link to your log (see here to find it and how to share it) and the version of Mechjeb you where using (shown in MechJeb Menu). I don't have the game up and running, but can't you use Advanced Transfer to Another planet, set Duna as the target and then click the ASAP button? Sadly not, just checked it, (thanks for the tip though, never investigated that as the manual has nothing on it), but it still tries to plot a prograde trajectory, (which is fair enough, retrograde needs more dv than is remotely sane, your velocity at encounter with duna would be 14kps and you have to shed 9kps of kerbin orbital velocity first to get that). I don't think MJ currently has anything that would plan a retrograde transfer. Cheers, to be fair the hard part is getting a retrograde sun orbit setup, once you haver that setting up a retrograde intercept isn't too hard. I just don't know how to setup a retrograde sun orbit from kerbin SOI. Can't think that would be the best way to achieve a retrograde Sun orbit. 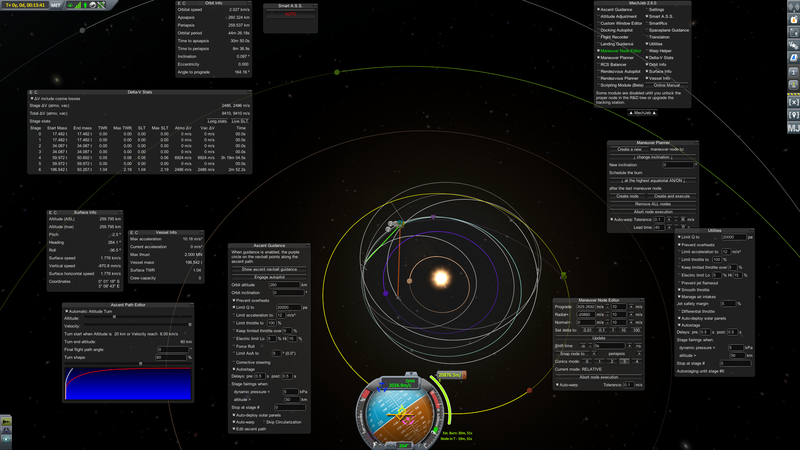 Kerbin travels at ~ 9196 m/s around Sun (of course, prograde). You can of course setup a retrograde burn relative to Sun while still in Kerbin's SoI (need to burn so to increase Ap in the opposite direction of where Kerbin moves, meaning burn prograde in Kerbin's LKO when Sun rises above the horizon) but why waste 9196 m/s DV that way? (that would only be useful in case you want to dive into Sun, and even in that case would be better to save DV using a slingshot from Eve or other bodies). Going farther away from Sun however reduces orbital speed (Jool speed is on average ~ 4120 m/s) therefore is easier to set retrograde Sun orbit by first raising Ap. And then, intercepting a massive body as Jool at the correct angle (get a Pe in front and higher of Jool) provides a lot of DV to make that retrograde orbit. Well i managed via messing with the node editor and setting a manual node to get it to work, turns out i need even more d/v than i thought, joy. Thats led me to a new issue, built a multi-stage ion for the obscene dv, but can't get MJ to recognise ion stages beyond the first. What do you need from me serbin? Not sure what if any logs you'll need on this one. A direct retrograde shot from kerbin is the only trajectory that will get me there in time, and thats a maybe. Thing is i'd never touched the controls for that before except my accident, so i had no clue how to work it, i just experimented till stuff happened. Also ethier KSP or MJ dosen;t like retrograde trajectories as anytime i reduced the dv to try and fine tun the encounter it deselected duna as a target. Not sure weather that's KSP or MJ though. Not sue if maneuver nodes even exist in stock, i get them impression they do but i could be way off base, again if serbian needs logs just tell me which logs he wants, i assume MJ has several given all the modules and VAb vs SPH vs flight, plus KSP's own logs that may or may not be applicable. Still managed to do it, but annoying. Currently trying the burn without having proper craft dv info, will se how it goes, have a save to revert to if needed from pre launchpad. Minor note, figured out the odd d/v display. Xenon does not appear to respect cross feed settings, so it was all one stage from the PoV of fuel consumption. Joy. Back to the drawing board. I've recently had a power outage twice (I haven't got any UPS) while playing KSP and both times my mechjeb configuration got messed up - all the custom windows I've made were gone and I was unable to recover from this using mechjeb's interface. I had to remove MJ completely, install it again and customize again - quite a pain as I like setting up orbit and surface windows in a similar fashion to KER's hud displays. I prefer MJ's font to KER's as during a landing bigger font is easier to quickly read. It's not a big deal as power outages are extremely rare for me yet all the other plugins maintained their configs (admitedly very few mods are as customizable as mechjeb is). I the end I simply backed up the main config file to avoid this again. Regardles, MJ is a truly magnificent piece of code and is extremely useful as it allows to automate some of the boring stuff. Great work! I made some change in the dev release to fix a recurrent memory allocation that may also help with those corrupted config on power loss. MJ was saving its config way too often. First time opening KSP all the MJ windows are in the top left corner. Re-arranging them in the right place and then returning to the VAB then launching again and all the windows are back in the top lift corner. In other words, it looks as though the window positions settings aren't now being saved at all. So it's intentional that #683 resetted all custom windows i assume? It is not... I ll have a look later today or tomorrow. Content, position or both ? Sarbian, I have a suggestion, my inclination is to believe that it wouldn't be extremely difficult, but I'm no expert. Ok, this was actually quick. It should work now. Sure. Just give me a version of Trajectorie's API than can run in a thread. I'm not too familiar with the details of the API, is does MJ require an API to run in a separate thread in order to use it? MJ requires the math to be done fast because it need the trajectory updated often for the landing AP to work. To do that the lending sim is done in a thread. Trajectories code cannot run in a thread so I would have to run it each frame and the frame rate would plumel. 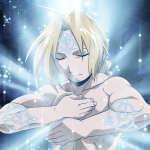 The problem is not me copying an other mod code. I know perfectly what need to be done for FAR (and stock support for lift) to work. But I don't see how to do it fast enough or without copying half of FAR code. I'd like to understand this a bit better. 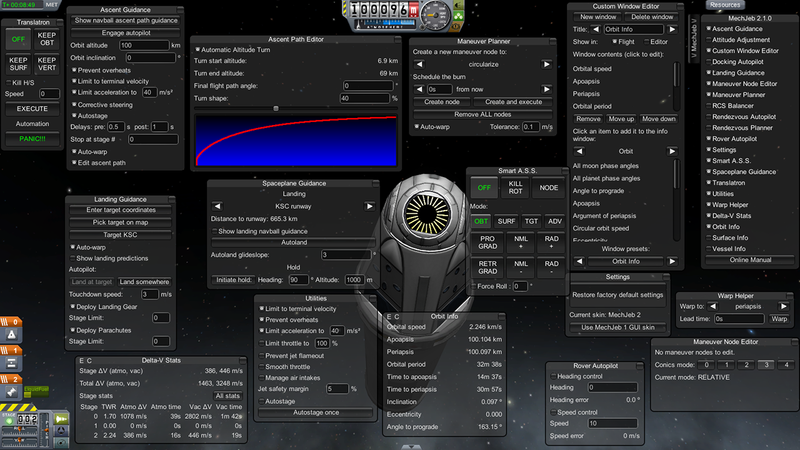 Trajectorie's calculates the trajectory live without a frame rate issue, and people have written KOS scripts that use the Trajectories API for landings. What keeps MJ from doing the same thing? Actually it's even worse than i thought, the default VAB windows aren't even on and nothing i customize seems to save. Current situation: All i have in the VAB are "Custom Window Editor" and "Settings", so i create a Delta-V window with the preset for it. Exit to space center, back in VAB, the dV window isn't listed. In the latest dev version: Has anyone else had any issues with window positions resetting every time you enter a new scene? Same here. Outside VAB/SPH all windows work. (At least those that I tried.) Inside VAB/SPH only 'settings' and 'custom'. I came here to ask about the same thing others have noted: window positions aren't saved at all, so far as I can see. After every scene change, the window positions all default back to the upper left corner. In addition, in the VAB (haven't checked the SPH), the dV and Vessel Info options aren't available at all. I also have a secondary issue but it is probably something @sarbianis already aware of, but I want to confirm that before I try to duplicate it exhaustively and provide logs. In the Landing Guidance, MJ does what a friend of mine describes as "stutter warping" - after the initial de-orbit burn, when in prior versions, MJ would warp a good ways through the descent, go back to real-time and make a correction, then maybe warp again before final descent and landing, now MJ instead seems to cycle between 1X, 2X, 5X and maybe 10X all within a matter of seconds, constantly adjusting the speed of the warp but never really just settling down, warping, unwarping and landing. The accuracy (on Minmus) is phenomenal, but it take a much longer amount of real-time to perform a routine vacuum body landing. Is this problem already known or is it others have experienced?